Good, no, really great things are happening. A few posts ago I asked you to imagine…… Today I learned about the following campaign which I am summarizing for my readers in anticipation that great ideas will start flowing. 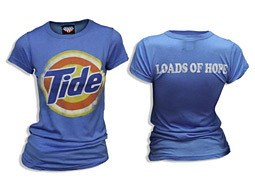 Procter & Gamble Co. paired 40 digital media and agency executives with 100 of its North American marketing directors in a contest to sell Tide T-shirts for charity, “Digital Hack Night.” The notion that this would be a sort of baptism by immersion into how social media works would not be lost on the participants. It was a crash course. The participants themselves added “Hack” to the event title. 140 media and marketing people leaned heavily on their social-media friends and followers, used big-name incentives and spent a total of about $4,000 on digital media to sell more than 2,000 T-shirts at $20 a pop for charity. The contest, a four-hour event, was Web-cast in reality show style. Their buzz online hit the top 10 trending topics on Twitter in the process. I love the idea. The team experience probably did more to expose P&G marketing directors to digital media than had they learned by stumbling through on their own. It really takes a team. Among the social media used was a YouTube video of the Global Marketing Officer offering an hour of his services advising a non-profit on cause-related marketing in exchange for a 100 shirt purchase. They blogged it, and spread the word via Twitter. They used a few conventional tools such as digital coupons and blast emails to a lesser effect. The effort raised about $50,000 directly for the charity Feeding America and another $50,000 in a match from the Tide brand. Thanks for sharing this story. I’m a big fan of looking outside the legal marketing arena into other marketing industries to glean fresh, creative ideas. This has so many fun facets -education, networking, branding, charitable, etc. This really is “great” stuff.